BCDVideo, the security industry leader in purpose-built performance video surveillance recording servers, announced today they were named to the 2018 Solution Provider 500 list by CRN®, a brand of The Channel Company. 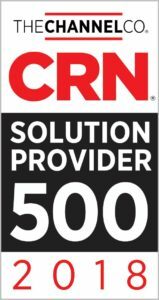 The Solution Provider 500 is CRN’s annual ranking of the largest technology integrators and solution providers in North America by revenue. It is the company’s second consecutive year on the list, climbing 36 spots to number 304. The CRN 2018 Solution Provider 500 List is a predominant channel partner award list, serving as the industry standard for recognition of the most successful solution provider companies in the channel since 1995. This year, for the first time since 2010, the complete list will be published on CRN.com, making it readily available to vendors seeking out top solution providers with whom to partner. “We never take this recognition lightly. A ‘provided solution’ is only meaningful with market acceptance. It is the trust and confidence of our security integrator partners that have made this such a success. While it is a significant achievement for the company, it speaks more to our employees and their sense of pride in what we do, how we do it, and most importantly, the passion behind why we do it.” – Jeff Burgess, BCDVideo President, and CEO. “The companies on this year’s Solution Provider 500 list represent an incredible, combined revenue of over $320 billion, a sum that attests to their success in staying ahead of rapidly changing market demands. We extend our sincerest congratulations to each of these top-performing solution providers and look forward to their future pursuits and successes”, said Bob Skelley, CEO of The Channel Company. The Channel Company enables breakthrough IT channel performance with our dominant media, engaging events, expert consulting and education, and innovative marketing services and platforms. As the channel catalyst, we connect and empower technology suppliers, solution providers, and end users. Backed by more than 30 years of unequaled channel experience, we draw from our deep knowledge to envision innovative new solutions for ever-evolving challenges in the technology marketplace.